Alright people, I'm going to be honest. 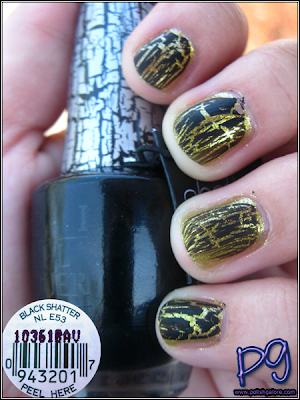 When I first heard about this "shatter/crackle" trend, I was miffed. 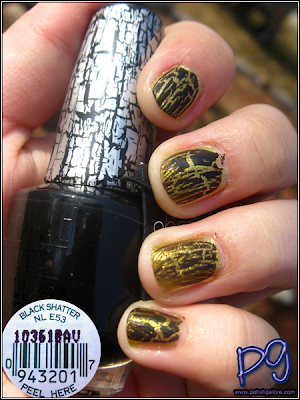 I feel like "shattered" nail polish resembles chipped nail polish which is such a no-no for me. Now granted, I said I didn't like matte nail polish originally because it looked too much like a chalkboard, and now I'm in love with matte. Would I feel the same about shatter/crackle nail polish? THE ANSWER IS DUH! YES! THIS STUFF IS AWESOME! I took my existing manicure of Simply Smash-ing! and just painted one thin layer of Black Shatter over it. 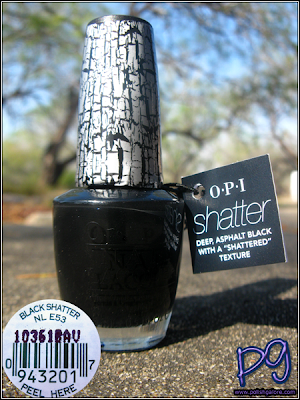 In about 20 seconds, the polish completely separates, leaving you with a cracked effect. I even took a video for you! Here are some finished pictures in the sun and in the shade. I did not use a top coat afterwards, but I recommend it if you like smooth nails (and I do). I love how we can see the crackling effect take place in the YouTube video so quickly! Super excited about Black Shatter! That looked so cool! I like how you can see it separate. were can you get black shatter polish..
OPI is available at Professional Salons, including Beauty Brands, Beauty First, Chatters, Dillard’s, JCPenney, Pure Beauty, Regis, Trade Secret, and Ulta, for $8.50 ($10.95 CAN) suggested retail for each Nail Lacquer.